Two boys go on a date through Grindr. One is trying to reduce his use of mephedrone and G, the other is struggling with his recent HIV diagnosis. When their date goes wrong, their paths spiral in different directions. Symptoms of modern gay London are encountered from slamming to intimacy problems, and the mental health effects of growing up LGBT in a straight man's world. But avenues of support exist in both boys' shared sexual health advisor, and a remarkable trans woman who runs the beauty clinic in Vauxhall. And at the play's heart lies a very contemporary gay love story. Written by Patrick Cash, The Clinic is informed by many hours of interviews and unprecedented access to NHS sexual health clinic 56 Dean Street in Soho. It is directed by Luke Davies (LAMDA), produced by Lead Substance Use Advisor at 56 Dean Street David Stuart and features a cast of legendary gay scene figures and incendiary new queer talent. The Clinic is at King’s Head Theatre, 115 Upper Street, Islington, N1 1QN, Monday 24th to Saturday 29th August. Hilariously the play features Fagburn's old chum, Stewart Who?, playing a character based on his nemesis, David Stuart. Here's an Attitude online interview with the cast. Full disclosure; The Clinic is written by Patrick Cash, who once wrote a very nice article about Fagburn. 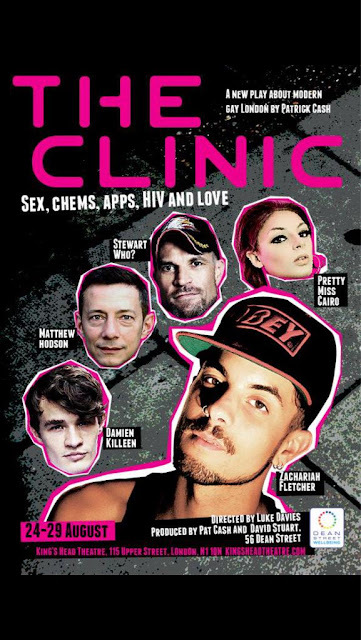 David Stuart writes on the joy of chemsex in the new FS magazine.